Prince William clearly likes Kate Middleton; after all, you don’t invite the world’s media round to your house to let them know you are getting married otherwise, do you? The fact is, two people are in love and are getting married next year. Just like 80,000 other couples will do in Britain in 2011. The difference between William and Kate is that the country will go crazy on the day of the Royal Wedding, with wall-to-wall international TV coverage, supplements in the newspapers, probably even a special edition of Hello Magazine. That’s to say nothing of the crowds that will camp out in London to get a glimpse of the future King and Queen as they travel by carriage down the Mall. I wonder how many people will line the streets for the wedding of Jack and Jill in Jarrow or Simon and Sally in Stroud? There is a big difference and it’s not that one couple is Royal and the others are Commoners. The difference is the Royal Family machine has already started massive, global promotion. A coordinated public relations campaign is underway between Buckingham Palace, the Government and probably many Commonwealth embassies to ensure that this wedding gets fans – loads of them worldwide. It is a project for which a team will have already been established and has probably been working for months on the planning, even though Kate was “surprised” by the proposal on a secret trip. But whether you take a cynical attitude or not to this wedding there can be no doubt that the PR machine that is the Royal Family is doing a brilliant job. But without all that PR and hype, the chances are The Wedding of 2011 would not be as popular as it now will become. In other words, the success of the forthcoming wedding day depends not on the caterers or the flowers, but rather on how well it is promoted. The marketing of the event is going to be the most important factor in it. But don’t tell Kate that…! 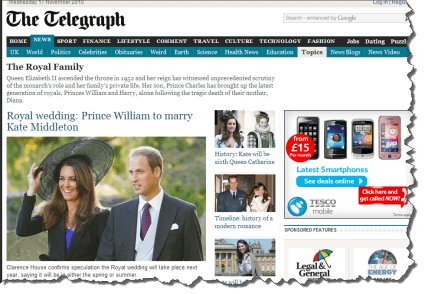 What the Royal PR Machine is doing is an important lesson for your website. Recently, new research showed that the companies that get the most “likes” on Facebook are not the ones that you might instinctively think “everyone would like them”. Rather, the ones that get the most fans are the ones that actually promote themselves the most. Do you like your business? The study showed that most people become a fan of a company because they were tempted by overt promotion by that firm. In other words, social “liking” of your business gets fewer people as fans than practical, out and out promotion by you. In essence, you have to demonstrate you like your own business and that you like it so much you are prepared to shout about it, before the rest of the world will really start to consider you seriously. True, the research did find that many people are prompted to like a business based on the recommendations of their friends. But most people “like” a Facebook page because they have seen the promotion by the company itself. That means, rather than trying to get people to share links, to recommend you to their friends and so on, the bulk of your effort in building an online fan base should be in blowing your own trumpet – er, rather like the Royal Family are doing over a forthcoming marriage. I think people become fans of facebook pages because they are asked to become fans – there is no shame at all in asking your customers to like you and it is a very successful tactic. But by blowing your own trumpet do you mean selling? You can shout loud about your knowledge, expertise and experience and you can share information about your charitable works and ethical position but I still don't think social media is another pipe to shove sales messages down. Lucy, you are right, social media is not about shoving sales messages down people's throats. But if you don't blow your own trumpet, who will…? In other words, it is about asking people to connect, to follow and giving them reasons from their perspective why that might be valuable for them.